The Community Engagement Team Coordinator reports directly to the Manager, Community Engagement. This position is responsible for Community Engagement Team projects and programs to develop, maintain, and strengthen community relationships. This is accomplished through a program of work in three (3) general areas: Community engagement in Agency Decision-Making, Community Liaison, and Community Engagement Programs. • Bachelor’s degree in Business, Public Affairs, Public Relations, Planning, Communications or related field. Additional relevant experience may be substituted on a year-for-year basis for up to four (4) years. • Four (4) years of progressively responsible experience in dealing with business, community or government relations, including researching and drafting responses to the public. • One (1) year of relevant lead or supervisory experience, and use of PC-based word-processing and spreadsheet applications. 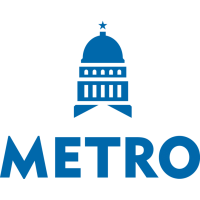 CAPITAL METRO IS AN EQUAL EMPLOYMENT OPPORTUNITY EMPLOYER. Consider joining the team that keeps one of the best and fastest growing cities in the nation moving!